"Now for the sure promises. First, if you will let your heart be drawn to the Savior and always remember Him, and if you will draw near to our Heavenly Father in prayer, you will have put on spiritual armor. You will be protected against pride because you will know that any success comes not from your human powers. And you will be protected against the thoughts which come rushing in upon us that we are too weak, too inexperienced, too unworthy to do what we are called of God to do to serve and help save His children. We can have come into our hearts the reassurance recorded in Moroni: 'And Christ truly said unto our fathers: If ye have faith ye can do all things which are expedient unto me' (Moro. 10:23). "There is another sure promise. 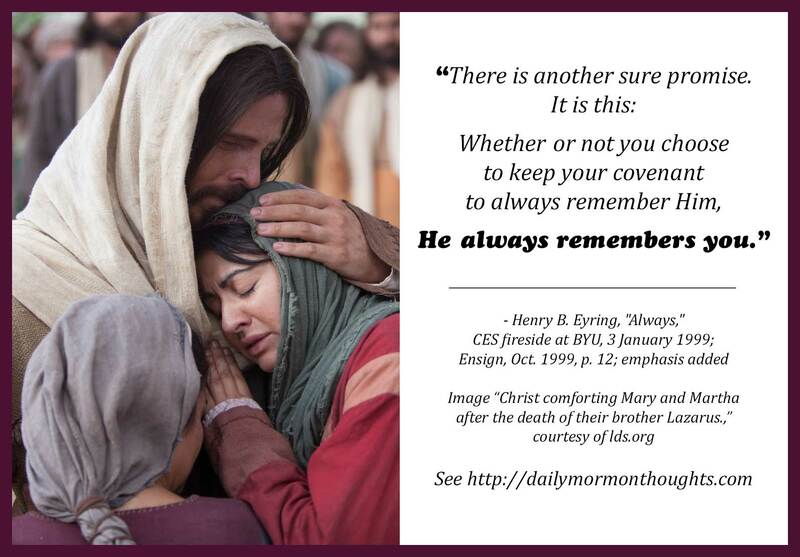 It is this: Whether or not you choose to keep your covenant to always remember Him, He always remembers you. I testify that Jesus Christ, born in Bethlehem, was and is the Only Begotten of the Father, the Lamb of God. He chose from before the foundations of the earth to be your Savior, my Savior, and the Savior of all we will ever know or meet. I testify that He was resurrected and that because of His Atonement we may be washed clean through our faith to obey the laws and accept the ordinances of the gospel." 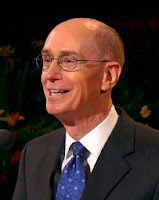 But in the second paragraph, President Eyring changes the tone. EVEN IF WE DON'T do our part to always remember Him, we have the assurance that He will always remember us. What a remarkable, comforting, strength-infusing promise!